If you’re thinking of making a delicious breakfast for your partner that also says that you love him/her, your search for the perfect dish is over. 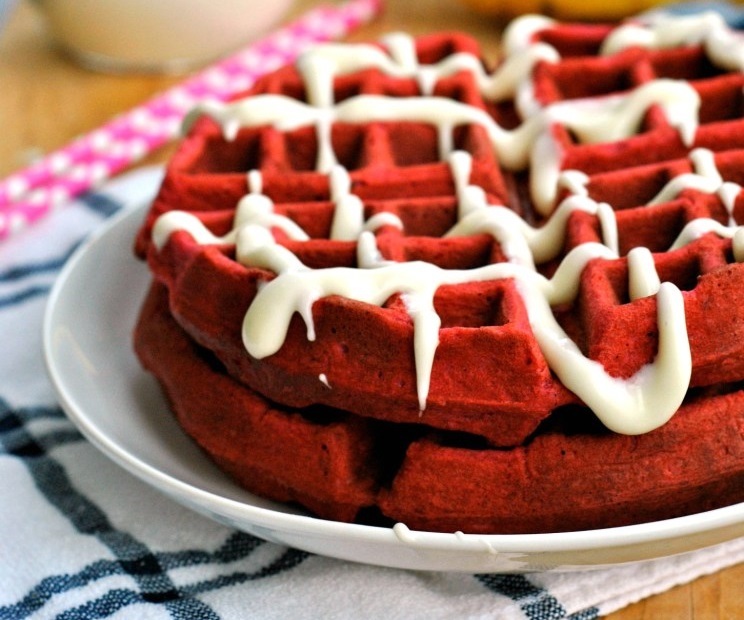 These unique and romantic red velvet waffles will bowl your sweetie over with their mushiness. Top them with soft cream cheese glaze to add that tinge of taste. Quick and easy to make, these waffles (adapted from goeatandrepeat.com) are a must this Valentine! Sift the flour, sugar, cocoa powder, baking powder and salt in a bowl. Combine the eggs, milk, butter, vanilla and vinegar, in a separate bowl. Mix wet ingredients with dry ingredients. Also add in food coloring and whisk to combine fully. Grease the pan with cooking spray and cook the waffles according to the directions on your waffle iron. While the waffles get cooked, prepare the cream cheese glaze. For this, beat cream cheese and butter in a bowl until fluffy. Slowly start adding the powdered sugar and milk to the cream cheese, alternating between the two. Beat with an electric mixer until well incorporated. When the waffles are ready, take them out onto serving plates. Spoon or drizzle glaze over warm waffles and serve immediately.